“Our nation decided more than 50 years ago, that businesses should be open to all, and today this ruling, while narrow, chips away at our right to equity and our value of being a society where no one should be rejected for being Black, Brown, low-income, a woman, or a member of the LGBTQ community,” stated Rea Carey, executive director of the National LGBTQ Task Force. “Nevertheless, while those religious and philosophical objections are protected, it is a general rule that such objections do not allow business owners and other actors in the economy and in society to deny protected persons equal access to goods and services under a neutral and generally applicable public accommodations law.” — Justice Anthony Kennedy, writing for the majority in Masterpiece Cakeshop v. Colorado Civil Rights Commission. 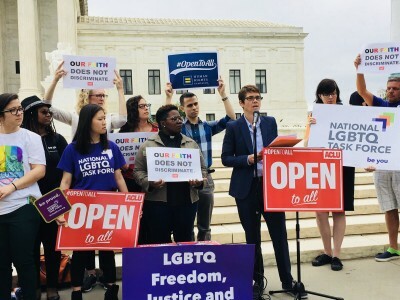 “This case was never about cake, it’s about whether religion, or speech that has a religious viewpoint, can override longstanding anti-discrimination laws that have been put in place to prohibit the egregious bigotry business owners historically have displayed towards people of color, women, religious minorities, and LGBTQ people,” stated Candace Bond-Theriault, the National LGBTQ Task Force’s Senior Policy Counsel, Reproductive Health, Rights & Justice and author of the Task Force’s Amicus brief.